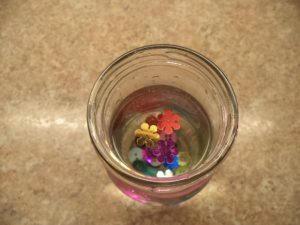 This dancing buttons fairy water science experiment is a twist on the popular dancing raisins activity. It’s fun to try something a little different. Raisins dance up and down in clear soda pop. We’re used to seeing things sink in water or float, but not usually both. 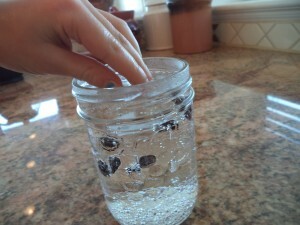 The bubbles in the soda carry the raisins up. When the bubbles all pop, the raisins sink back down. We called the soda pop fairy water and tried some different items. There were some shiny sequin shapes left-over from our fairy play dough fun. First, we had to check if they would sink in plain, ordinary tap water. 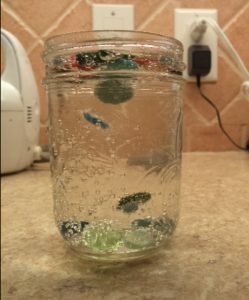 When we placed them flat on the water in a jar, they floated but when we dropped them in sideways they would sink and stay on the bottom. Now that we knew they would float, we were ready to try them in the fairy water. Big Brother and Little Sister said they would float. Big Sister said they would do both. Baby Brother was napping and didn’t express his hypothesis, even though he has plenty of opinions at other times. 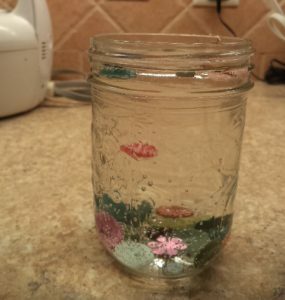 When we dropped the sequin shapes in the fairy water, they stayed on the top. The only way they would sink even a little bit was if we stirred them and poked them. So then we tried buttons. The kids looked thru the button box and choose 5 small ones each. We checked in the plain tap water that they would sink. They did. We talked about what would happen in the fairy water. Although the kids thought they would float, I suggested they might be too heavy. We put in all 15 buttons at once. What a show! The buttons danced up and down and up and down. We watched them for the longest time and checked on them periodically after that. After about 15 minutes, there were fewer bubbles so the sequin shapes would sink a little if we poked them. It took longer for the bubbles to build up enough for the buttons to rise but there was still action. Simple science activities can be such fun. 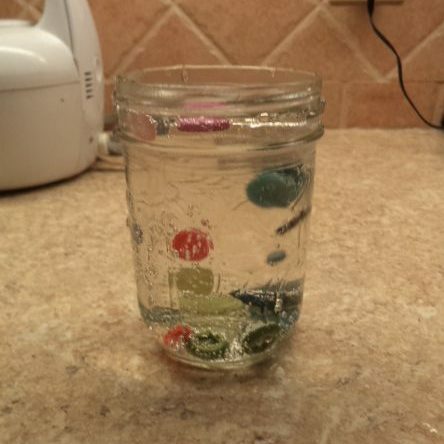 We’ve added a variation to the raisins to make our own dancing buttons fairy water science experiment. Any suggestions for what we can try next? 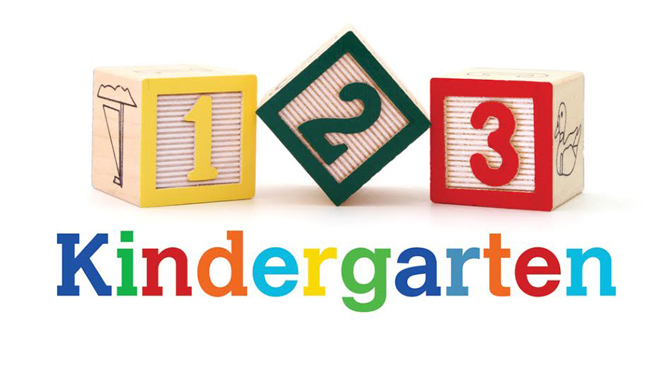 For more fairy activities, come and play on the 123kindergarten blog. The Google doodle for Oskar Fischinger was a swirl of color, shapes, and sounds; it inspired this visual magic milk swirling color science experiment. The sound was our squeals of wonder as we watched the art-in-action in a dish. 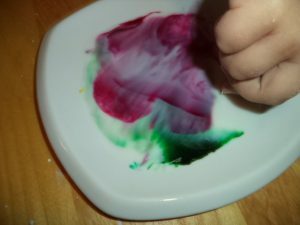 Usually, this magic milk swirling color science experiment is done with red, blue, and yellow food coloring. When coloring Easter eggs, we used up the blue and yellow. Somewhere in the cupboard there is a brand new box but all we could find was the old box with red and green. 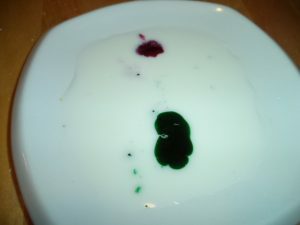 To start, pour a little bit of milk in a flat dish like a saucer or shallow, wide bowl. You will need milk with fat content, not skim. Someday, we want to try this using cream to see if there is a difference. Carefully squeeze in a couple drops of each color in different spots. At this point, kids really want to mix the colors. Instead, talk about what might happen, then watch. What does happen? Do the colors move or mix? There isn’t much going on. Squirt a couple drops of liquid dish soap into a small lid. 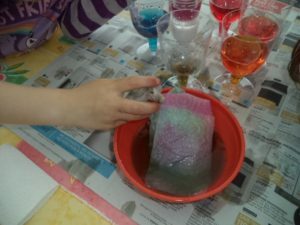 We use soap to wash hands and dishes; will the soap wash the colors? 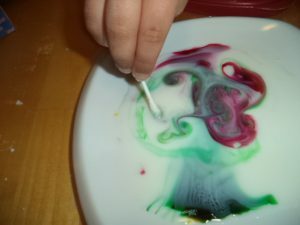 Dip a q-tip into the soap and then dip it into the middle (more or less) of the puddle of milk and color. Take the q-tip right out. No stirring needed. The colors start to tumble, mix, swirl, and dance on their own. Is that what the colors did before using the bit of soap? What made the difference? There’s lots to talk and wonder about now. The action just keeps happening, almost as if it’s magic. After watching this for a bit, kids just have to stir with the q-tip. Of course, the colors really do mix now to make a muddy pool. Who could resist? 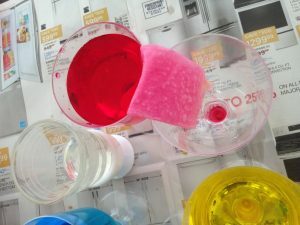 Did we need fairy dust for this magic milk swirling color science experiment? Nope, just a little soap added to the milk and color. There is a scientific explanation involving how molecules breakdown and combine, but to the eyes it looks like magic. Once done stirring, it’s easy to wash up with the dish soap. What other magic can soap do? 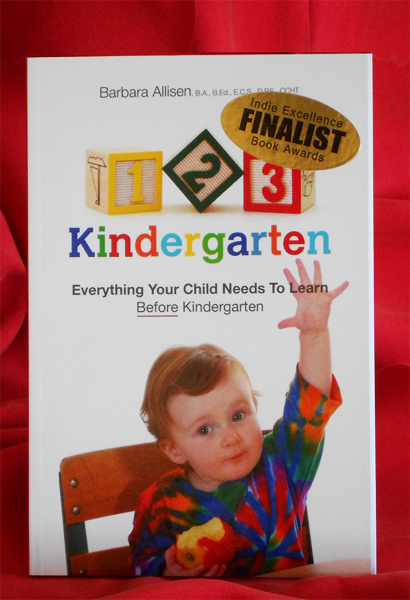 No need for a magic wand for play activities; come back to the play-of-the-day on 123kindergarten.com. 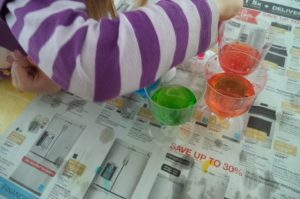 Messy play doesn’t have to cover the whole house; this mixing colors messy play science experiment was limited to the kitchen table but the play wasn’t. First, we placed 6 clear glasses in a circle. We filled 3 of them with water and squirted a couple of drops of different food coloring in each one. There was one glass of red, yellow, and blue. The other 3 glasses were empty. Big Sister said she thought the water would transfer from the full glasses to the empty ones all around. When I asked Little Sister what she thought might happen, she didn’t answer the question but volunteered to mix up all the colors. The next step is the double magic. 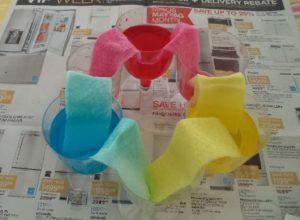 We folded a length of paper towel and placed one end in a glass of colored water and the other end in an empty one next to it on both sides. We repeated this until we had what looks like 6 bridges, linking all the glasses. 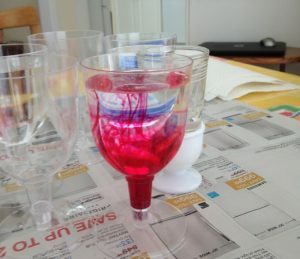 When we placed the paper towel in the red glass, it started moving down the dry end of the paper towel immediately. Before we’d even finished folding and putting in all the bridges, the water from the red glass was already dripping into the empty one. When they were all done, it only took a couple of minutes for the water level to start creeping up in the empty glasses. 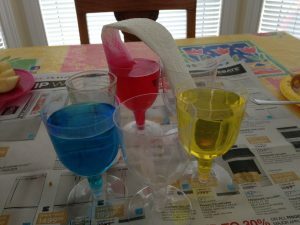 Not only did the water transfer from the full glasses to the empty ones, but the colors mixed too. And it didn’t take long at all. 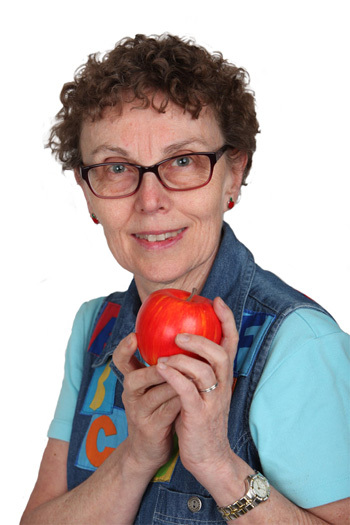 From starting with the 3 colors of red, yellow and blue, there were now all 6 with orange, green, and purple. In the photo, there isn’t much difference between the red and the orange but it was more noticeable looking from the side. Little Sister very much wanted to mix the colors. With an eye dropper she got bits of colored water from each glass and squirted in the others. The paper towels were in her way so she put them in a bowl. 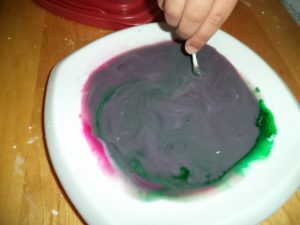 After squirting and mixing for a few minutes, the colors were certainly messy. At this point, she used the paper towels to soak up the water in the glasses and squeezed the water out into the bowl. 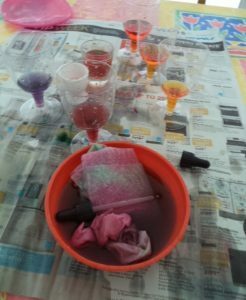 Now there was a messy concoction of towel and brown-grey water, beyond the original intention of this mixing colors messy play science experiment. Big Sister was more interested in the science experiment aspect. Little Sister was simply experimenting to see what she could make happen by squirting and squeezing. When both were done, clean-up was pretty quick. The value of the play was different for each of them, but it was fun and learning for all of us, me included. 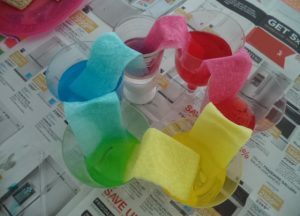 Can this mixing colors messy play science experiment inspire some messy play and learning for your child? Tomorrow, we’ll do another messy play activity so come play.